A Web service that crowd sources the graphic design needs of a small business at a price of their choosing is receiving a warm response from budget-strapped entrepreneurs, but a more tepid response from freelance graphic artists. Co-founded by B.C.-native wunderkind Matt Mickiewicz, 99designs launched its local Canadian site at the beginning of October. Billing itself as the world’s largest online marketplace for graphic designs, the site allows businesses to hold contests to have any graphic design work completed – be it a logo, banner, or entire Web site. The business names its price and the opportunity is promoted to more than 120,000 graphic designers registered with the site, who may submit an entry. The business chooses its favourite entry as the winner, and that graphic designer gets paid. An example of a contest for logos held on 99designs. Since it’s 2008 inception in San Francisco, 99designs and recently got an infusion of $35 million in funding led by Accel Partners, an investment group that has also funneled money into household Web names like Facebook, Groupon, and Dropbox. That money is going towards localization projects in Canada, the U.K. and Australia and soon Spanish-speaking countries. After seeing 120 per cent year-over-year growth of Canadian users on the U.S. site, Mickiewicz knew it was time to go local. Toronto-based Tutorlab.com Inc., a Web-based education company, had its logo designed using a 99designs contest. As a young company starting from scratch, it was a great opportunity to have a logo created for $500, says Brent Diefenbacher, chief operations officer at Tutorlab. The firm was happy with the result. Diefenbacher says he’d recommend the site to other small businesses and is considering using it again to have a banner ad created. 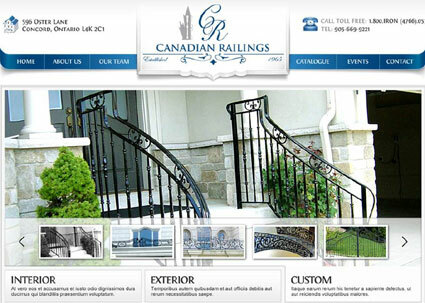 A winning Web site design from 99designs. While customers are pleased (the site offers a 100 per cent money back guarantee if the business doesn’t like any designs, and few of those have been issued according to Mackiewicz), freelance graphic designers are wary of the precedent it sets for their craft. Designers who don’t win the competition don’t get paid for their work, and must work to the prices named by businesses. 99designs also takes 25 to 30 per cent of the payment offered by the business. Victoria Dobbs, a Toronto-based graphic artist, says she wouldn’t sign on to participate on the site. Another freelance graphic designer, Amy Mamtura, says the site looks more appropriate for inexperience graphic artists, and the tight timelines could rush the design process. “It seems like something a young designer would sign up to do, but not a designer that puts in a lot of time and effort to truly understand the project they’re working on,” she says. Mickiewicz started his first business in 1998 when he was just 15-years-old. SitePoint served as an online news and community hub for Web developers and designers. In 2005, the young entrepreneur noticed that graphic designers with spare time on their hands were self-organizing contests on SitePoint’s forum. The site mainly serves as a way for graphic designers to generate leads for future work, the co-founder says. Forty per cent of projects lead to follow-up work for winning artists. The winning logo design now used for Tutorlabs. Dobbs says that while winning artists may be getting follow-up work, those that lose the contests are just “spinning their wheels.” She also cautions other graphic artists against joining the site. “I’d advise even people starting out to avoid something like this, because it sets a precedent for the industry I don’t think is a good one,” she says. According to site literature, 99designs pays out more than $1 million to graphic designers each month and sees 4,500 projects completed each month. That breaks down to a payment of $222.22 per average project. That’s not much, Dobbs says. 99designs also offers a ready-made logo store, where 13,000 designed images are available to be customized for a buyer. Prices start at $99. The Canadian site is seeing tens of thousands of visitors every week already, Mickiewicz says.